Laura Mercier products are something that I didn’t think I’d delved too deeply into, but it turns out I am apparently in love with the brand. I used this base – the radiance primer. I know, I talk about this all the time but it’s so gorgeous on the skin and one that I use all the time and forever repurchase. One to try this winter to perk skin up. On top of that I like the smooth finish flawless fluide – it’s not an absolutely amazing essential foundation, but it sits nicely on the skin. RIP silk creme. The old blogger chestnut – the cheek colour in lush nectarine. Ah, so pretty on the cheeks, and one of my first dips into the world of peachy blush. The eye art artist’s palette is all kinds of pretty – it has lots of pinky shadows and a good mix of matte and shimmer. I have a special gift in that I can use any palette and manage to make it look boring… the same look every time. In the look above I’m wearing ‘bamboo’ all over the lid with some ‘truffle’ to blend it out. ‘African violet’ is the most amazing shimmery purple pink that really catches the light. The palette has pretty sturdy packaging and definitely has a grown up sort of feel. If you can grab one of these, do! It’s such a good introduction to the Mercier brand. I wore the shadow on top of the eye primer… do not recommend. My lip jam – the creme smooth lip colour in Spiced Rose. Ugh this has become such a staple in my bag because the creamy formula feels amazing and the colour literally goes with any look and manages to make your lips look all glassy and ‘done’. 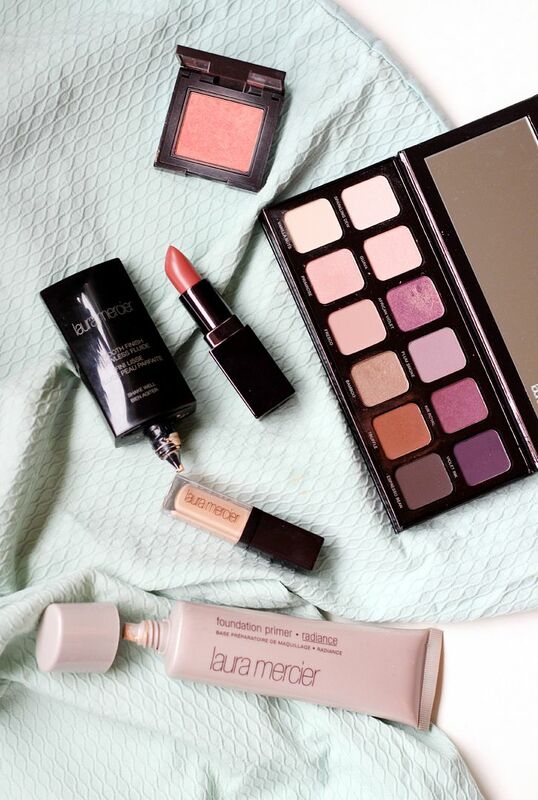 Have you tried anything from Laura Mercier?